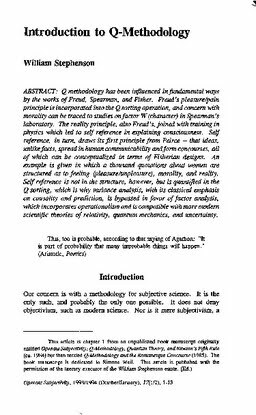 Q methodology has been influenced in fundamental ways by the works of Freud, Spearman, and Fisher. Freud's pleasure/pain principle is incorporated into the Q-sorting operation, and concern with morality can be traced to studies on factor W (character) in Spearman's laboratory. The reality principle, also Freud's, joined with training in physics which led to self reference in explaining consciousness. Self reference, in turn, draws its first principle from Peirce - that ideas, unlike facts, spread in human communicability and form concourses, all of which can be conceptualized in terms of Fisherian designs. An example is given in which a thousand quotations about women are structured as to feeling (pleasure/unpleasure), morality, and reality. Self reference is not in the structure, however, but is quantified in the Q sorting, which is why variance analysis, with its classical emphasis on causality and prediction, is bypassed in favor of factor analysis, which incorporates operationalism and is compatible with more modern scientific theories of relativity, quantum mechanics and uncertainty.